Kuchen is a German word for cake. It consists of a sweet yeast dough filled with a custard. Sometimes fruits are added to the dough. It is usually sliced like a pie. Kuchen is generally thought of as a dessert but it may be eaten any time of the day. I brought this Peach Streusel Kuchen to a birthday party yesterday evening. The presentation was gorgeous but it would have been better for a brunch thing as it was more bread-like than cake-like. It was mildly sweet with a fine and dense texture. The peaches were not as sweet as I would have liked. Somehow they were sadly lacking in flavor this season. Perhaps apples or blueberries would have worked better. I would recommend that this be served warm with butter. Please note that the recipe below has been adjusted with a little more sugar. This is a rarity for me as I usually cut back on the sugar. 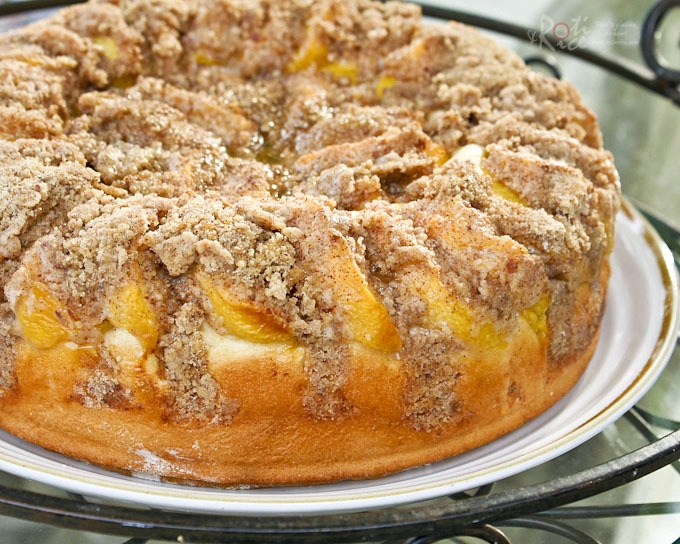 Peach Streusel Kuchen - a bread-like coffee cake with a fine and dense texture topped with fresh peaches and cinnamon almond streusel. Combine bread flour, sugar, and salt in the mixing bowl of stand mixer and whisk till combined, about 30 seconds. Add yeast and whisk for another 30 seconds. Change out wire whisk with dough hook. Add egg, butter, and milk. Turn on mixer on speed 2. Mix for about 5 minutes. Scrape down sides of bowl and dough hook. Remove dough hook and cover with a plate for 15 minutes. Reattach dough hook, and mix for another 10 minutes to form smooth pliable dough. Remove dough and shape into a ball. Lightly oil mixing bowl. Return dough to bowl, cover with plate and allow to rise for about 1½ hours or almost double in size. Lightly oil a 9-inch spring form cake pan. 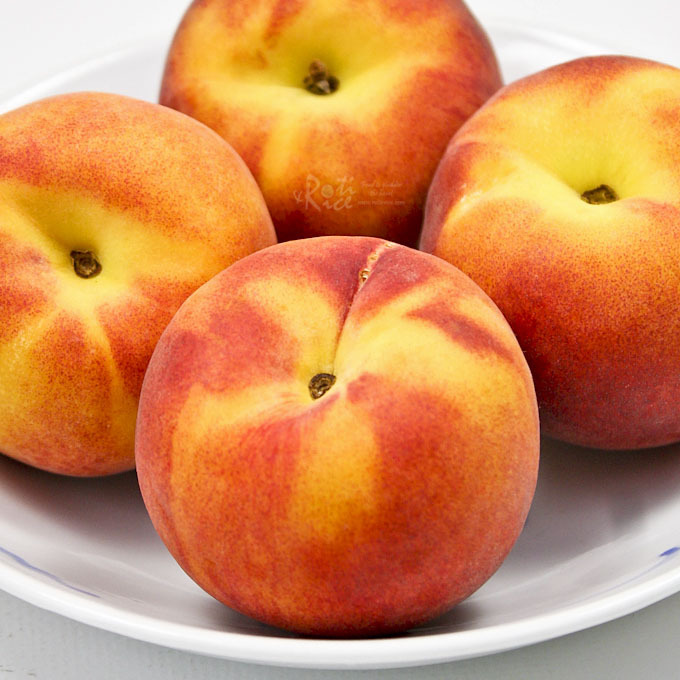 Peel and slice peaches into ½-inch slices. Mix all topping ingredients in a medium sized bowl until mixture resembles coarse breadcrumbs. When dough is ready, remove from mixing bowl and place on a lightly floured surface. Punch it down gently and roll it out to fit the pan. Ease it into position. Arrange peaches on top of dough. Sprinkle topping over peaches. Cover with lightly oiled plastic wrap and set in a warm place to rise slightly for about 20 minutes. Meanwhile, preheat oven to 375&#176F (190&#176C). Bake kuchen for 30 minutes or until golden brown. Allow to cool in pan for 10 minutes. Serve warm or turn onto a wire rack to cool completely. **Peaches may be substituted with 3 large apples or a pint of blueberries. I so want a piece of this for my breakfast! 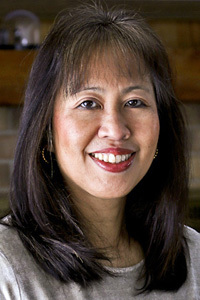 Thanks Patty! Yes, this would be good for breakfast. I wish there wasa slice left. Thanks Lyndsey!The kuchen did look quite impressive. 🙂 For some reason the peaches this season look great but lack flavor. This is my second batch but they are not sweet. I had to add some sugar to neutralize the tartness. 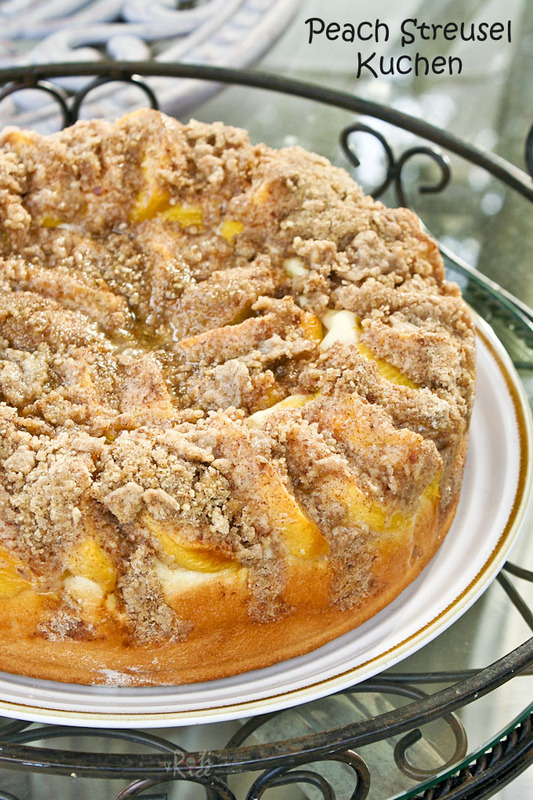 Your peach streusel kuchen looks beautiful! I made an apple version a couple of months ago and really enjoyed it warm with a cup of Earl Grey Tea. I wish we have fresh peaches here! Thanks for the compliments and for buzzing! That fruit salad was gorgeous! One of the guests did a great job in cutting up the fruits and layering them. I really like this Kuchen with the peaches on top. 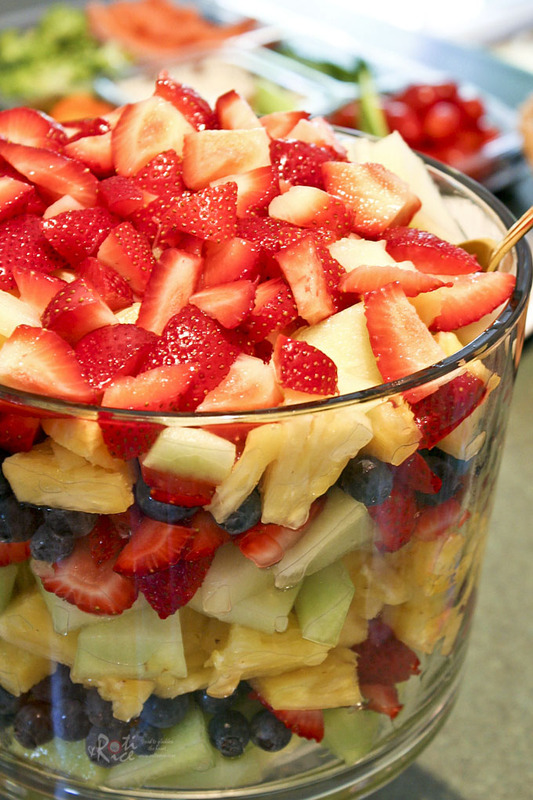 Looks so yummy. Anyway Biren, have you seen a Baumkuchen before? also a German cake and it is very popular in SG. Thanks Ann! I am going to try with apples or blueberries next time. The kuchen looked very nice but the peaches this season are not as sweet as I would like it to be. What a lovely cake, Biren. The toppings are full of flavour too. It’s perfect for any time of the day. 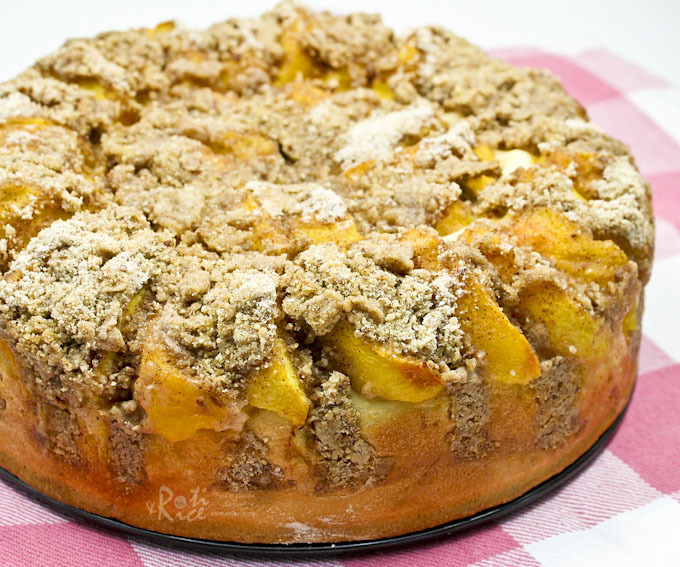 Ooh…this peach streusel kuchen looks so delightful and delicious, it reminds me very much of my days in Germany when we used to eat streusel kuchen regularly! Great recipe, Biren. What a lovely cake! Perfect for tea time. 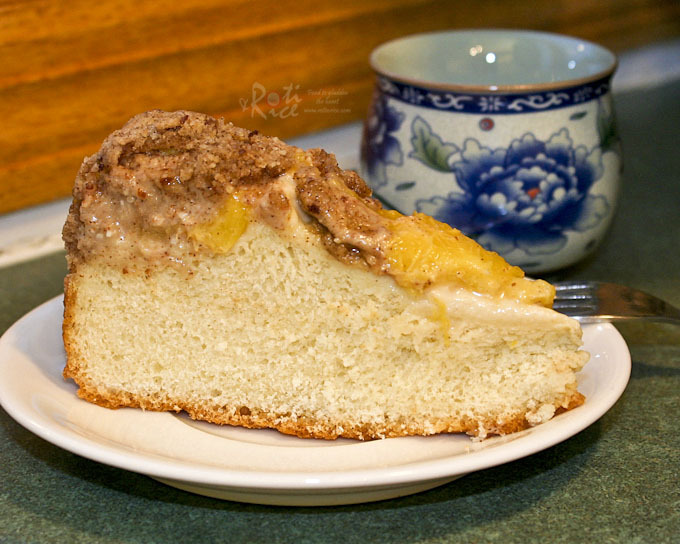 We love peach streusel cake, esp. my husband! Yours looks scrumpy! I love the look of this kuchen, I have bookmarked a similar recipe but have been procastinating as usual…would love to try this soon….that salad looks gorgeous! Looking at the slice, I thought it is soft and fluffy like a cake. Biren this looks so yummy! I love anything with fruit and crumb topping. I wish I had a slice for dessert tonight. Awesome cake! Sorry to hear that your peaches weren’t as good as you hoped. Maybe next time you can try to make them with so called “wild” peaches. They look like wheels have a lot more flavor then the normal round ones. I’ve heard about Kuchen but never made it before. This is so gorgeous! That’s a gorgeous Peach Kuchen, Biren! Your pictures made me crave for some right now! YUMMYLICIOUS! omg! this is sooooo PRETTY! and look so much like a cake. YUMMY!!! Beautiful cake. I have a box of peaches from Trader Joe’s that I need to do something with. This will be perfect for the holiday weekend. Enjoy your week! Oh..how gorgeous the cake look, Biren. Love that click of Peaches. And the dessert is tempting. Hope you had fun at the party. What a lovely cake! The streusel looks especially tasty. This looks like something I would love! I love anything with streusel! And those peaches are just gorgeous… 🙂 Great post, Biren! Have bookmarked this straightaway! Lovely! Biren, I am loving the topping so much. Simply irresistible. Hope I can have a slice too.